(Kitco News) - All eyes will be on Switzerland this weekend as traders watch to see if the populace approves a referendum that would mean the central bank would have to ramp up its buying of gold buying over the next several years. As of now, the market expects the referendum to fail, based on polls. As a result, while a “no” vote could mean a dip in gold prices, traders and analysts also look for any weakness to be limited. But if it were to pass, most say this could provide an impetus for gold to spike higher and also mean a higher base for prices in the future due to the increased central-bank buying that would be expected. The “Save our Swiss gold” referendum would require all of the Swiss National Bank’s gold to be held within the country and forbid the future sale of central-bank gold. The provision capturing the most attention is one requiring at least 20% of the central bank’s assets to be held in the precious metal. Based on current reserves and gold prices, this would mean purchases of some 1,500 metric tons or more over a five-year period, analysts have calculated. According to data compiled by the World Gold Council, Switzerland’s current official holdings of gold are 1,040 metric tons. This puts the country eighth on a list of central banks and the International Monetary Fund. The Swiss gold holdings account for around 7.8% of the central bank’s total official reserves, said Jeffrey Nichols, managing director of American Precious Metals Advisors and senior economic advisor to Rosland Capital. HSBC, in a research note this week, also estimated that passage would mean the SNB has to buy 1,500 tons of gold. This would be more than China’s record gold consumption in 2013. Further, this would be equal to roughly half of annual global mine output, HSBC said. Other banks have calculated that Switzerland would have to buy even more than 1,500 tons, although some of this hinges on the price of gold when calculations are made. However, Commerzbank pointed out earlier this month, it is difficult to determine the exact volume that would be required. For instance, the SNB would have to further increase gold purchases if it had to buy euros to defend the minimum exchange rate. But then, should the measure become law and gold prices rise, the value of the SNB’s gold holdings also would be higher and therefore mean the SNB has to buy less gold. Commerzbank said passage of the referendum potentially could be a “turning point” for gold, which has been in a bear market for three years. To gauge just what might happen, analysts pointed to moves after other official purchases in recent years. When China announced in 2009 that it had increased its gold holdings by 454 tons over the previous six years, gold rose 6% in a month, Commerzbank said. When news broke later that year that India’s central bank had bought 200 tons of IMF gold, gold rose 15% in a month. the clearly more negative market sentiment (now) compared with 2009 points in the other direction,” the bank said. Other analysts also offered caution. Barclays said in an early-week research note that passage of the referendum would boost sentiment, but pointed out that implementation would likely take a while. Incremental demand might end up only replacing disinvestment elsewhere, Barclays said. The referendum was introduced by members of the Swiss People’s Party, claiming it would mean a stable Swiss franc. The SNB and Swiss Finance Ministry have been vocal opponents of the measure. For one thing, they argue that it would hinder the central bank’s ability to adapt monetary policy. It could also influence authorities’ ability to intervene in the foreign-exchange market to keep the currency from getting too strong and thereby hurting the domestic economy, with the SNB having set a euro/franc floor of 1.20 francs. A poll a week ago by research institute gfs.bern showed that only 38% of participants supported the Swiss referendum. Forty-seven percent were opposed and 15% undecided. Another poll, by the newspaper 20 Minuten, also showed the measure does not appear to have majority support. There is an old market axiom that traders tend to factor into prices what is expected to happen ahead of a major event, which is why some doubt failure will have a dramatic impact on gold. Flynn said that gold already blipped lower last week when the poll results were announced. Gold has rallied from a low for the year of just above $1,130 an ounce on Nov. 7 to recent highs just above $1,200 an ounce. This has led to speculation that anticipation of the Swiss vote has aided the gold bulls, meaning potential long-liquidation selling if it fails. However, HSBC said recent gains by gold probably are more due to increased emerging-market buying at lower prices than the referendum. HSBC said there are anecdotal reports that the “yes” camp is more energized and the “no” camp less visible. “This has led to speculation that the country could ‘sleepwalk’ into a ‘yes’ vote,” the bank said. Analysts have pointed out there is another step necessary for the measure to become law; it must also be approved by the majority of the nation’s cantons. This means a “double majority” is needed, as Morgan Stanley strategist Joel Crane put it. At one time, HSBC said, the Swiss franc was 100% backed by gold. However, in 1992, the country joined the International Monetary Fund, and member currencies cannot link their currencies to gold, HSBC explained. 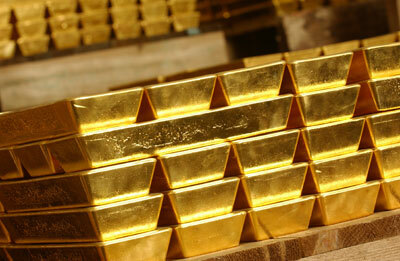 Since 2000, the SNB has sold about 60% of the country’s gold reserves, or about 1,500 tons, HSBC added.